“Florida Public Archaeology Month is a great opportunity for us as the Florida Archaeology Network to showcase the different kinds of history and archaeology that are here in Northwest Florida and throughout the state,” says Nichole Bucchino, outreach coordinator for FPAN. The kickoff event on Saturday, March 1 is “Dash Through the Past,” a run/walk scavenger hunt race in downtown Pensacola. Dash through the Past will begin and end at the FPAN Coordinating Center at 207 East Main Street in downtown Pensacola (next to the Fish House). This race through historic, downtown Pensacola offers individuals or teams of two a chance to compete over a two-mile course for prizes. Registration starts at 9:00 a.m. and the hunt begins at 10:00 a.m. Each participant will receive a map and a list of challenges on the day of the race. There is no set route or order in which challenges must be completed. Prizes will be awarded to first place and runner up. 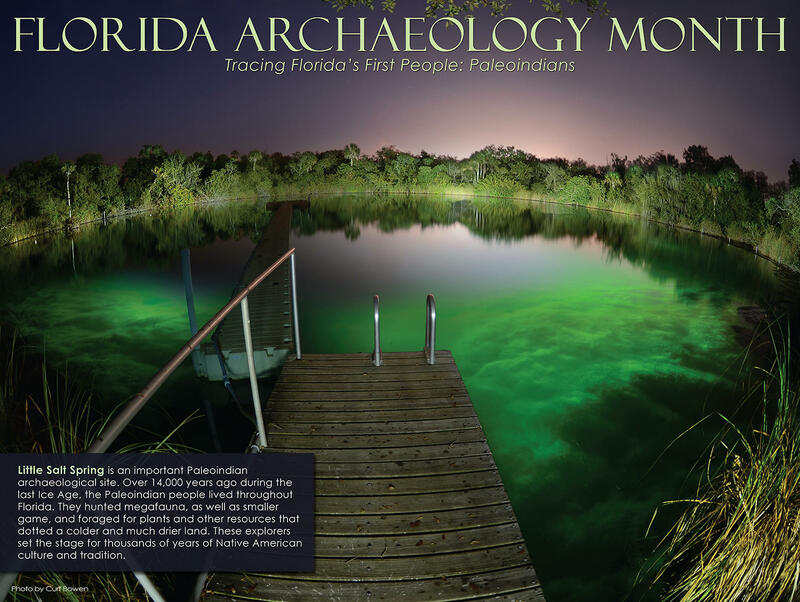 Participants will also have a chance to pick up a free copy of the 2014 Florida Archaeology Month poster. Also featured during Florida Archaeology Month is the “Beyond Our Backyard Lecture Series,” to give people an idea of archaeology that’s taking place around the world. This year speakers will present on sites as far away as Ghana, Madagascar, Germany and Poland. The lecture will take place every Thursday in March at 7 p.m. in the main branch of the West Florida Regional Library at 239 North Spring Street in downtown Pensacola. The first lecture, on March 6, features Norine Carroll, UWF Archaeology Institute Collections Manager/Research Associate with a talk titled "The Evolution of Archaeology Madagascar and the Serapis Project." The event is free and open to the public. Another event is the annual “Tour de Fort” bicycling tour of archaeological sites located in the Fort Pickens area of Gulf Islands National Seashore. The event is Thursday, March 20 at 9 a.m., beginning with a Power Point presentation at the Fort Pickens Auditorium. “Eglin Archaeology Day” is Saturday, March 22; 10:30 a.m. at Jackson Guard located at 107 Highway 85 North in Niceville. Another feature of Archaeology Month is the poster that’s created each year. The theme is on Paleoindian Florida, a time period during the last great ice age some 15,000 years ago. “On the front, we have some landscape photography of some archaeological sites from the Punta Gorda area, the Warm Mineral Springs and Little Salt Spring,” says Thomin. He says the images were taken by Curt Bowen, a professional photographer who’s been published in National Geographic. 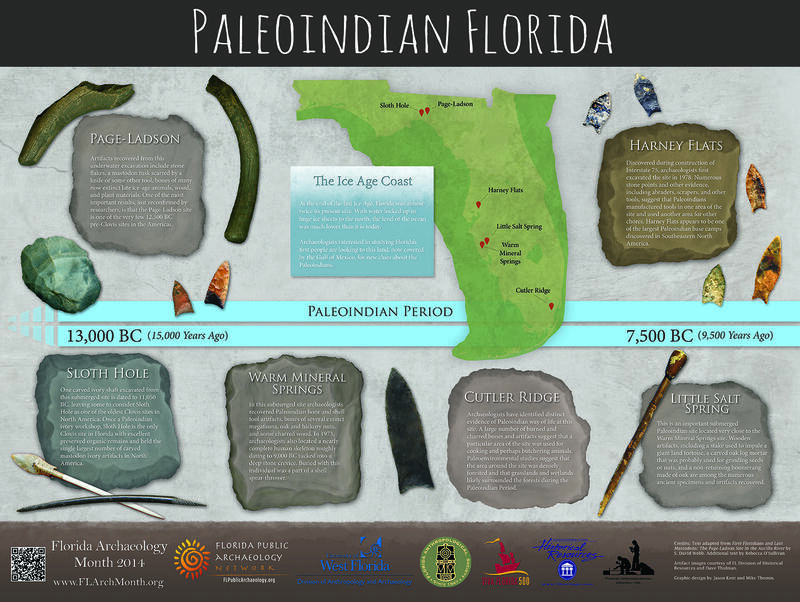 The back of the poster highlights, with a few archaeological sites from around the state that are from the Paleonindian period. The poster will be distributed at events throughout the month and a digital version is available online at http://www.flarchmonth.org/. More information is available at www.flpublicarchaeology.org. To hear about Florida's archaeology, listen to WUWF 88.1FM weekday mornings at 7:33 for Unearthing Florida with Dr. Judy Bense. The City of Pensacola's plate is full these days given the work to lure ST Aerospace, develop a fish hatchery downtown, a major change in a city ordinance, and upcoming elections. WUWF's Dave Dunwoody sat down recently with Pensacola Mayor Ashton Hayward.